Shirts With Random Triangles: OT prospect Joshua Black flips 2019 commitment from Western Kentucky to Georgia Tech. 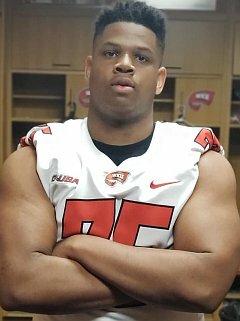 OT prospect Joshua Black flips 2019 commitment from Western Kentucky to Georgia Tech. Joshua Black. Image via 247Sports. From the “He’s Just Not That Into You” department comes word that Stone Mountain, Georgia High School senior offensive tackle Joshua Black has flipped his 2019 commitment from Western Kentucky to Georgia Tech. The decision to flip came after Black visitited the Georgia Tech campus in Atlanta on Saturday, which led to an offer from Yellow Jackets head coach Paui Johnson. A a second trip to the campus folllowed on Monday. “I loved both visits,” said Black. “Georgia Tech is a 35 minute drive for me (from home) and it was easy to get over there. Black is currently unranked by 247Sports. Black attends Stephenson High School in Stone Mountain, Ga. He stands 6’4, and weighs 270 lbs. The addition of Black raises the number of commitments of Georgia Tech’s 2019 football recruiting class to eleven.